World Photographic Cup 2018 Results announced. Team USA strikes again! The World Photographic Cup 2018 winners announced. After winning the cup at home in 2014, and again in France on 2015, the winner of the 2018 World Photographic Cup is… Team USA again! The second place goes to Australia, with Mexico in the third place. Individual gold medals go to Australia, Finland, Malaysia, Singapore and USA. Individual winners and the Cup winning Team of the 2018 World Photographic Cup (WPC), sponsored by the FEP  Federation of European Professional Photographers, PPA  Professional Photographers of America, the UAPP  United Asian Professional Photography and the AIPP  Australian Institute of Professional Photography, has been finally announced on May 6th , aside the Head On photo show, in the Chauvel Cinema theatre in Sydney, Australia, in cooperation with the hosting AIPP. 30 national photographic teams (best record ever) entered the fifth edition of this one of a kind Olympics-styled competition, from Europe, Asia, North America and South America and Oceania. The Golden medals in the six categories went to: Onni Wiljami Kinnunen, Finland, for the commercial category, Ben Shirk, USA, for illustrative, EngTong Tan, Malaysia (nature), Keren Dobia, Australia, for portrait, Gail Nogle, USA for the reportage/photojournalism”, and Raymond Phang -Singapore for wedding. Also appears in the medals table: silver medal Ben Shirk, USA and bronze medal Andreas Varro, Sweden in the commercial category; silver medal Eduardo Gómez,Mexico and bronze medal Vincent OByrne, Ireland for illustration/digital art; silver medal David Eliud Gil Samaniego Maldonado, Mexico and bronze medal Dan McClanahan, USA for nature; silver medal Erich Caparas, USA and bronze medal Haseo Hasegawa, Japan in the portrait category; silver medal Christopher Ian, Australia and bronze medal Paul Wright, Canada for the reportage/photojournalism; and finally silver medal Marceliano Munoz, USA and bronze medal Deric Wan Kin Tong , Malaysia for wedding. While gold, silver, and bronze medals have been awarded to the individual creators in each of the 6 categories, teams were awarded points for top ten finishes. They received 10 points for gold, 9 for silver, 8 bronze and that follows to the tenth top image. Ireland team finished the competition in 10th place, tied with Singapore. They also finished in a two-way tie in 8th place Finland and Japan, with Portugal (defending champion) in 7th and Malaysia in the 6th place. In an amazing 5th place, Russia. In the 4th place, just close to the podium, Sweden. The second place trophy, with 1 gold and 1 silver medal, plus 3 top-ten finishes, went to the home Team Australia (third time on the podium since 2014). And the winner of the 2018 World Photographic Cup, with 6 medals (2 gold, 3 silver, 1 bronze) plus 4 top-ten finishes, was Team USA (already winning in 2014 and 2015). Congratulations to Team USA for winning the WPC for the 3rd time, and to all the winners! An incredibly competition, with a huge variety of winners, from 4 continents, is exactly what the WPC committee could hope for, commented Kylie Lyons, representing Australia at the WPC Governing Committee. It has been amazing to host the ceremony and to see so many photographers and so many beautiful images coming from around the globe!. 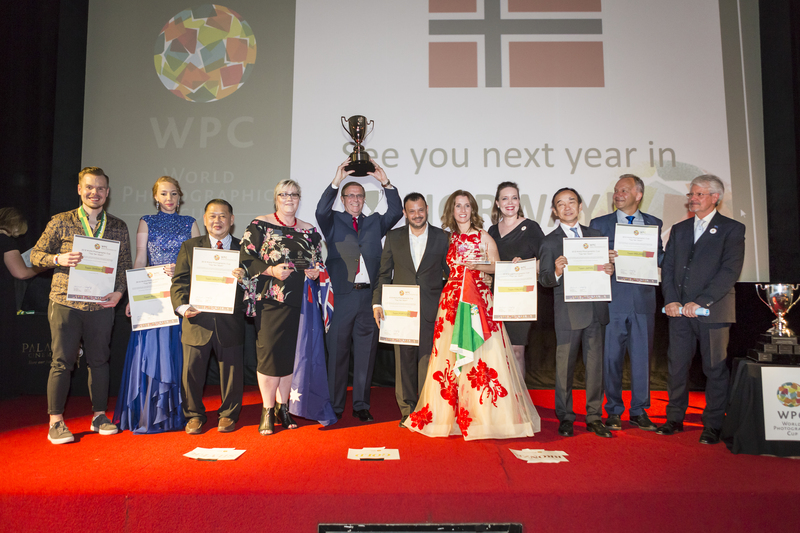 The WPC CEO also thanked the AIPP for having organized such a beautiful event, and announced that the next WPC finals will be held in Drammen, Norway on April 8th, 2019. He finally thanked the WPC Gold Sponsors ChromaLuxe and KoyLab, two important companies related to the photographic market, for their continuous support to the project and to the professional photographers around the globe.